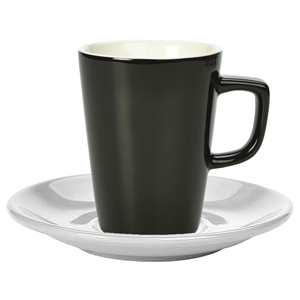 The Royal Genware Black Latte Mug and White Saucer offers a truly stylish monochrome look for serving fresh coffees or tea. With Royal Genware superior quality, these coffee mugs and saucers will stand the test of time. With a high standard porcelain, these latte mugs and saucers feature impressive high impact resistance. Ideal for ensuring durable strength on vulnerable edges and minimising chipping.